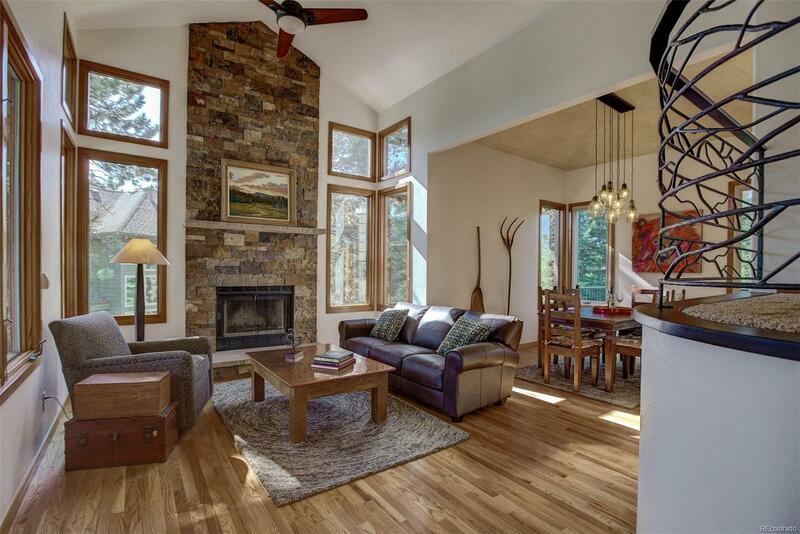 Mountain contemporary eleganceâa light-filled home with outstanding upgradesâfantastic kitchen, beautiful bathrooms & designer touches throughout. Great mountain view from the brand-new deck & the BIG kitchen window. The contemporary stacked stone wood-burning fireplace sets the character of the living room. A modern chandelier graces the dining room. Ann Sacks tile back splash, honed granite counter top & stainless appliances compliment the wall-to-wall knotty alder cabinetryâa kitchen to love! Family Room features second wood burning fireplace & more windows. Custom-designed railings lead to 3 bedrooms âa Master with a sophisticated spa-like en-suite bath, 2 more bedrooms sharing an updated Jack-n-Jill bath. In the walk-out basement find a den area for TV & games, an updated bath, non-confirming bedroom & a flex space with enough room for office, crafts, exercise and toys. Just a short hike to Dedisse park, the lake, downtown Evergreen, easy access to I-70, Denver and the mountains.